With a large national park covering 20% of the island and being home to a varied wildlife including donkeys, goats, and iguanas, as well as majestic rock formations in the shape of natural bridges, pools, and caves adorned with ancient Amerindians paintings, Aruba is a big natural playground waiting to be explored. 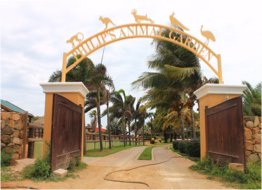 If you find yourself wanting more nature-based activities, the island has plenty more to offer with places like the ostrich farm, donkey and bird sanctuaries, a butterfly farm, and an animal garden. And if it's a bit of adrenaline you're after, head to the coast and enjoy the thrill of the great surfing, diving, kitesurfing, and windsurfing spots. When you're craving a bit of civilisation, spend a day getting lost in Oranjestad and admire the beautiful Dutch architecture of its historic buildings, sample the local fare at one of its renowned restaurants, or go for a shopping spree in the little street boutiques and large malls, before enjoying a sunset cocktail by the beach. Equally charming, the man-made landscape of the island will inspire you with its unique and colourful multicultural influences. 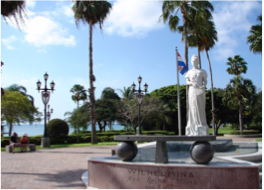 Boasting a superb architecture, the island's capital, Oranjestad, is the perfect expression of the Dutch and Caribbean blend that are at the origins of Aruba's roots, creating a one of a kind, picture perfect background. One of the town's main attractions for many decades has been Charlie's Bar, where scuba divers would come to hang their underwater discoveries on the walls, turning the place into a bit of a museum over the years. Named after Netherlands' longest-ruling monarch (1898-1948), the tropical gardens feature a statue of the Queen, laid in her honour in 1955, as well as a statue of Anne Frank inscribed with a moving quote from her book. The local music can be enjoyed every Thursday for the local Carubbian Festival, featuring music, performances, local food and crafts from the Caribbean region. Besides its bountiful culture, the town also has beautiful beaches to offer, such as Baby Beach, a family-friendly spot with quiet waters, the stunning Rodger's Beach, and Boca Grandi, a great beach for kite-surfing! Further on Wilhelminastraat is a stretch of traditional Aruban houses traditionally known as cunucu, and which are low houses with a sloping roof rising to a saddle roof in the centre, benefiting from the natural air conditioning provided by the wind. The oldest cunucu here is at number 27 and dates back to 1877. Though it is located just 12 miles southeast of the capital, the "Sunrise City" feels like a totally different world. Once a thriving place, at a time when the country's oil industry was booming, the town is now a place of authentic Caribbean flair with beautiful beaches that feels a world away from the glitzy Palm Beach resorts and shopping centres. Aruba counts as many as 50 churches representing various religions, the island's predominant faith being Roman Catholic. Standing proudly at the island's northwestern tip, in the Hudishibana region, the lighthouse was originally raised to warn ships from the Aruban coastline, and named after the S.S. California, a ship that sunk prior to the lighthouse's construction in 1910. 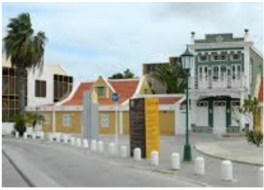 Hosted in the historic Ecury family home in Oranjestad, the museum displays a collection of Indian artefacts dating back to as early as the Pre-Ceramic period of 2500 BC. In total, the exhibits document three periods of the Amerindian habitation of the island: the Pre-Ceramic period (2500 BC - 1000 AD); the Ceramic Period where from 900 to 1515 AD; and the Historic period running from 1515 to 1880 AD. Legend has it that when European explorers in search of gold and treasures discovered Aruba, they called it Oro Ruba, meaning Red Gold. Centuries later, the island we now know as Aruba saw its history shaped by many gold prospectors come to find their fortune in the land of Red Gold, and traces of this history can still be experienced today. Located on the drive from San Nicolas to the northeastern coast, in Seroe Pretto, this unique Catholic shrine was created in 1958, under the guidance of a priest named Erkamp, and named after the famous French religious landmark. Powerful music, colourful costumes, spectacular parades and satirical calypso are a few of the element composing this strong and vibrant month-long celebration that transforms Aruba into a cultural storm at the beginning of each year. Spread over 7,907 acres of land, Aruba's national treasure covers almost 20% of the island and is home to a wide variety of animals and plants that it aims to protect and preserve. 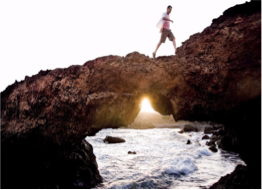 Thousands of years-worth of powerful waves and strong winds painstakingly chiselling away at its north coast's limestone cliffs, to create Aruba's impressive natural bridges. Its most famous one, located between the Bushiribana gold mine ruins and Andicuri Beach, collapsed in 2005, but still attracts visitors who also come to see the intact Baby Bridge nearby. Located in front of the Old Dutch Windmill, and just a short walk away from the Palm Beach resorts, the small but bountiful sanctuary is home to no less than 80 species of birds, including herons, egrets, gulls, skimmers, coots, cormorants, and numerous species of ducks, that you can observe either from the land, or from the observation tower. It's not just their colourful heritage that makes Aruba so special, the island is famous for its eco-friendly approach to life, where the natural environment and ecosystem is not only respected but protected, through a sustainable balance between socio-economic development and the conservation of natural resources. The park is also home to the Quadirikiri, Fontein and Huliba caves, which house and protect colonies of harmless bats, as well as authentic Arawak Indian drawings. On the coast, you will also find Daimari Beach, Dos Playa, and Boca Prins which, although unsafe to swim, are a picturesque spot to stroll along. Hidden at the heart of the Arikok National Park, along the Windward coast, are these shallow caves with dramatic stalagmites and stalactites formations and colonies of bats. Founded in 1997, this initiative was originally created to save and protect donkeys who were left abandoned on the island after having been replaced by modern modes of transport, suddenly having to find their own food and water, and sometimes even enduring abuse. Venture to the farm and meet a flock of about 80 of one of the world's largest living species of birds. 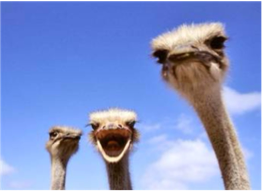 Learn about the ostrich natural behaviour, survival instincts and get closer to them by feeding them off the top of your head. The best place to go hiking in Aruba is obviously the Arikok National Park, with its 29 miles-worth of rocky trails, featuring three levels of difficulty. Maps of the trails are available at the Visitor Centre, which you'll find at the entrance of the park, and guided tours are free of charge, beside the park's regular entrance fee, and recommended. Located just north of Hooiberg, the Casibari Boulders Clusters emerges from the arid soil to create an atypical effect that is unique to the area. These huge tonalite boulders, some weighing several tons, sit together to create this rock formation through which the Government has created walking trails and steps, for hikers to reach the top and enjoy the amazing views of the island. Located on Palm Beach, the farm offers the opportunity to learn and watch the life cycle of the beautiful insect, from egg to caterpillar, chrysalis, and finally butterfly, and discover many colourful species from around the world. Arrive early to make your visit even more special by witnessing new butterflies emerging from their chrysalis and taking their first flight. This world-class shelter and rehabilitation centre was created by Philip Merryweather who, after years of saving abandoned and abused animals, decided to open the centre to the public and offer educational tours, where visitors can observe, approach, and sometimes pet the over 50 species of exotic animals present at the centre. Aruba's most popular Snorkel and Sunset Cruises are aboard the Teak Schooners, Jolly Pirates. The Jolly Pirates talented crew will perform back flips, literally to keep their guests returning year after year. And... you can go on a pirate ship! Travellers in search of adrenaline will find their thrill in the island's constant trade winds which, along with soft sandy beaches, shallow blue waters and great weather, make of Aruba the ideal place for all levels of wind surfers and kite surfers, all year round. Novice windsurfers will enjoy the shallow waters at the Fisherman’s Huts. If you're looking to ride the island's best waves, go to Wariruri, near the collapsed Natural Bridge, or in Dos Playa where the waves are more powerful and shallow. Other popular spots include Andicuri, Boca Grandi, Arashi Beach, and Nanki Reef. Located in Noord, this course offers sweeping views of the coastline, alongside beautiful contrasts of rolling greens landscaped with cactus hazards and water features, providing a game made challenging by the constant tradewind conditions. In Oranjestad, this narrow 9 hole-course provides challenge and entertainment, with the wind often leading the ball in an unintended direction, making it a very satisfying game when managing to land the ball.